On October 13th, 2009, a new CGI animated DVD is hitting store shelves. 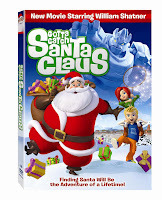 This DVD "Gotta Catch Santa Claus" features William Shatner as the voice of Santa. The premise of this story is that a group of children attempt to catch Santa in order to prove his existence. This movie is also scheduled to be included in ABC Family's 25 Days of Christmas. Take a look at the vivid, colorful, and lively animation in the trailer below . . .